Dubai, United Arab Emirates, September 20, 2018: DigiCert Inc., the world's leading provider of scalable PKI solutions for identity and encryption, Gemalto, a global leader in digital security, and ISARA Corp., the leading provider of quantum-safe security solutions, today announced a partnership to develop advanced quantum-safe digital certificates and secure key management for connected devices commonly referred to as the Internet of Things (IoT). DigiCert already works with many companies and consortiums using PKI to authenticate, encrypt and provide integrity for their connected devices. 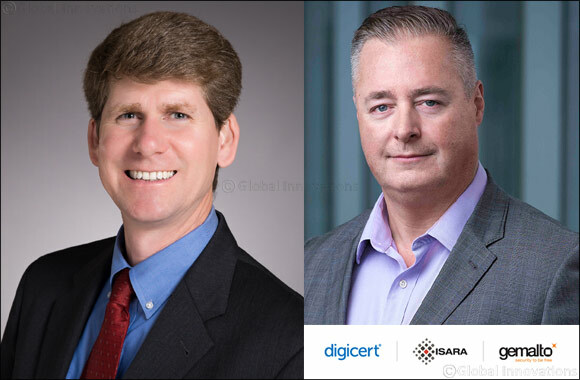 ISARA recognizes DigiCert's track record in advancing many of the certificate innovations in use today, as well as its robust certificate management capabilities, and in operating the industry's most ubiquitous, trusted roots. Gemalto offers secure key storage and management via its SafeNet Hardware Security Modules (HSMs) that integrate with DigiCert APIs to enable large-scale, automated credential issuing for connected devices via an internet-enabled gateway to distribute identity over the cloud. Certificates obtained through this partnership will be enabled with quantum-safe cryptography ahead of any breakthroughs that could eventually lead to quantum computing threatening connected device security. Consider the automobile industry, which is producing more vehicles with semi- and fully-autonomous driving capabilities. A car should last for 20 years or more, and manufacturers will need to ensure that the IoT devices they install will be secure and continue to function even if there is a breakage in the RSA algorithms that would render today's digital certificates ineffective.